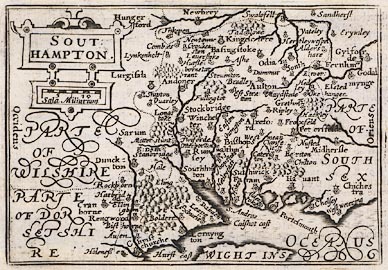 Map, uncoloured engraving, Southampton, ie Hampshire, scale about 16.5 statute miles to 1 inch, by Pieter van den Keere, 1620. The map is from the 1666 edition of the atlas, with the text for Surrey on the reverse, but is the same map as the 1620 edition. The map scale is in old english miles, about 1.25 statute miles.